We are a renowned name in the market for providing the best Industrial Machine Parts Fabrication Services' at affordable charges. We are backed by a team of professionals who work in coordination with the clients and render these services, accordingly. Also, we make use of premium raw material for fabricating strong machine parts. Our services can also be modified to suit your specific requirements. All you need to do is give us a lead, we will approach you shortly. 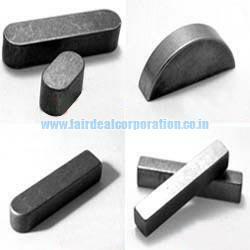 Our Ranges : Parallel key & woodruff key.